Being an independent publisher in this day and age is hard. Here’s some proof: well-respected publisher McSweeney’s has become a nonprofit. The hope is that McSweeney’s will continue to sustain itself. Several other nonprofit publishers have, including Red Hen Press in L.A., Beacon Press in Boston and Graywolf Press in Minneapolis. McSweeney’s publishes adult and children novels, literary criticism and journals, a magazine, and poetry. Hopefully it’s reputation and well-known founder, Dave Eggers, will help to keep it afloat. But if it doesn’t succeed, it may be a sign of the times that either big-name publishers or self-publishing is the way to go. In case 92 bestsellers weren’t enough, Danielle Steel has a few more up her sleeve. According to Entertainment Weekly, the prolific author just struck a 10-book deal with Ballantine Bantam Dell, an imprint of Penguin Random House. Steel has sold 650 million books worldwide. Apparently every single book of her is a bestseller, making her the biggest selling author alive. With this deal, she already has four books set to be released next year. Recap: On page one, we dive into the diary of Sara Harrison Shea, known from legends dating back to the early 1900s as the woman who mysteriously died at 31 and whose husband killed himself soon after. The reason? According to the legend, Sara’s daughter, Gertie, — who was already dead — killed her. According to the legend, Gertie is a “sleeper,” a person who has been revived from the dead. This legend carries on for generations throughout West Hill, Vermont, the land of the “Devil’s Hand,” where every few decades another mysterious death happens and where stories of “sleepers” live on. In present day, it’s troubled teenager Ruthie and her six-year-old sister, Fawn, who are left to wonder if the stories are true. But as soon as their mother Alice goes missing, they’re forced to find out once and for all. They stumble upon several wallets in their home. The wallets belong to people who they’ve never heard of. They set out to find the couple, only to learn that they are dead too. Suddenly their mother’s disappearance seems like less of a coincidence and more of a strategic kidnapping — and possible death — that can only be explained by more than 100 years worth of mythology and mystery. Analysis: The sci-fi mythology and mystery around which the story centers is just the beginning. 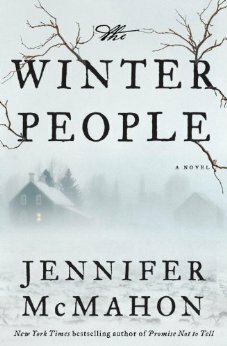 Author Jennifer McMahon’s storytelling is what makes The Winter People complex, scary, and page-turning. The novel flips back and forth between 1908 and present day — between diary entries from Sara Harrison Shea and the perspectives of Ruthie and several other characters. Over time, the bits and pieces from each section come together to show that the characters are connected and that the legends may be truer and (literally!) closer to home than Ruthie thinks. The beginning is confusing. There are lots of characters, and it’s hard to keep the relationships between them straight. But it’s clear from the onset that very strange things are happening in this town, and albeit (so!) creepy, The Winter People is written in a way that makes you want to learn the truth, no matter how horrifying it might be. It’s worth noting that a lot of the gruesome sections are focused around young girls, and the creepy wackjobs generally turned out to be women. Maybe the author’s way of saying all women are a little crazy? But as I think it’s her way displaying that all women have their secrets — and to discover them is either a blessing or a curse. MVP: Ruthie. She’s the most stable of the characters and the only one who’s not creepy. She should be commended for keeping a good head on her shoulders and keeping calm during her journey to uncover the mystery. Get The Winter People in paperback for $11.21. First comes the book, then comes the movie. Sometimes first comes the book, then comes the TV show. But every once in a while, the TV show comes first, and then spinoff books are written. Such is the case with the CW’s The Originals. According to Entertainment Weekly, The Originals executive producer Julie Plec is currently working on three novels based on the TV series. To tell the 1,000-year history of the characters, Plec will pen three books in an Originals trilogy: The Originals: The Rise, The Originals: The Loss, and The Originals: The Resurrection. The books are due to be released in February, April and June, 2015. The TV show itself is already a spinoff of the CW’s biggest hit show in years, The Vampire Diaries. Now in its second season, The Originals tells the story of the original siblings returning to New Orleans for the first time since the early 1900s. He acts! He directs! And now he writes! According to Vulture, Oscar-winning actor Tom Hanks plans to write a book of short stories. This comes after he made his short story debut in The New Yorker. Yes, Tom Hanks loves typewriters. In fact, he loves them so much, he collects them and helped create an iPad app that lets people type and print documents as if it’s on an old-fashioned typewriter. But a book full of stories about pictures of typewriters? Seems a little iffy to me. But hey, whatever floats your boat!